Familiar fabric, huh? Yeah, it's here too. But I love it, just love it. I wish I could find the flickr image or blog where I got the idea for this. What I remember reading is to use a charm pack, keep some of the squares as they are, cut some in 1/2, and cut some into 1/4ths. My apologies to the wonderful quilter who gave me the idea ... if you're out there drop a note so I can give you proper credit. I found a wonderful image on flick and used it as a basic guideline, though I left out the borders. The quilt measures about 40" by 52". The back is pretty bright yellow, as is the stitching. Yum. Please note the lack of model's in these pictures. Hmpph. C. has discovered the sewing machine (finally!!) and is working on a jumper similar to one made by Anna Maria's daughter, Juliana. I'm not sure how C. found the jumper, but she did and boy was she excited ... she woke me up too early asking for some help. I love that she wants to sew. She has always been a great help with putting fabrics together and giving me suggestions for embellishments and design ideas ... I can't wait to see what she comes up with for herself. I. is working on a science experiment about electricity. His dream is to be like Thomas Edison ... and as busy as his brain is I can see that happening! M. has discovered nail polish, more specifically putting nail polish on herself, and she and her best friend have been exploring new colors and changing their polish daily ... and today, right now, is no exception. And A. and K. are off investigating the dead mouse they found in the street ... right in front of someone's driveway. In their eyes the neighbor with the mouse-blessed driveway is some sort of celebrity. The only thing cooler than a dead rodent is a dead snake. Your work is SO so very beautiful!! 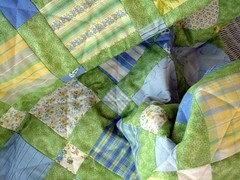 This quilt is, I think, the prettiest thing I have EVER seen. The colors just make me feel so happy. Will it be in your Etsy shop at some point? 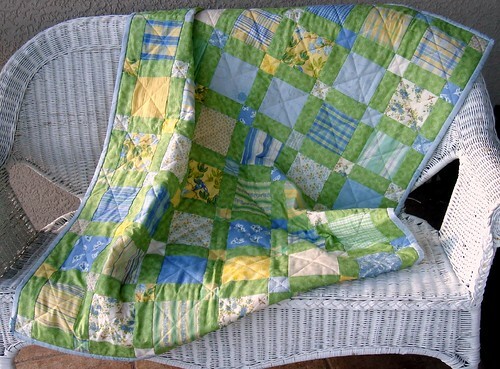 I tried my hand at quilting a while back and came to the conclusion that it was not going to be something I could pursue at this season of my life. 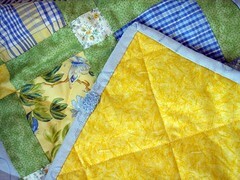 But I love them (quilts)! Thank you Jenni! 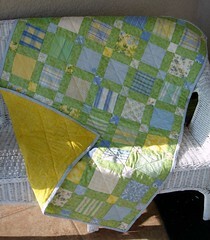 Yes, the quilt will make it to Etsy if I don't sell it in real life first. I'll post a brief note when I get it listed.